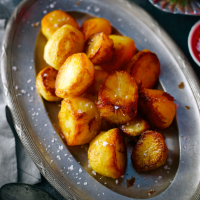 The key to a good roast potato is simple: use a floury variety, boil until they’re just soft on the outside but not quite cooked through, give them a good shake to fluff the edges, then roast till golden and crisp. 1 Preheat the oven to 200˚C, gas mark 6. Put a large roasting tin in the oven with the goose fat and allow to get really hot. Meanwhile, put the potatoes in a pan of cold water with plenty of salt. Bring to the boil, then reduce the heat and simmer briskly for 8-10 minutes, until soft on the outside but not cooked through. 2 Drain the potatoes and leave to steam dry in the colander for a few minutes before shaking to ‘bruise’ the outsides. 3 Tip the potatoes into the hot oil and return the tin to the oven – do not shake. After 10 minutes, turn and cook for another 40-45 minutes, turning every 20 minutes or so, until golden. Drain on kitchen paper; season with flaky sea salt before serving.